After working for eight years, Ji Xingang's bomb-defusing device is now used by many public security bureaus, fire stations, as well as oil and gas companies throughout China. For eight years, Ji Xingang worked relentlessly on his bomb defusing invention, modifying and improving the device. It was originally a hobby and he never thought it would be put to use. But the timing was perfect. He completed his project in March 2010 and in June 2010, someone from the public security bureau of Shijiazhuang, capital of Hebei province, found use for it. "I was so excited but also nervous when I received the call," says the 38-year-old. The caller needed Ji's device - a mobile water jet cutting machine - to detonate a 1.5-meter-long bomb covered with mud, which was discovered accidentally by an excavator driver while digging. He initially thought it was a rock. After some investigations, the ammunition expert from Shijiazhuang public security bureau, Wu Yongjin, believed it belonged to the Flying Tigers, a famous American air force group which supported the Chinese army in its fight against the Japanese invaders during the War of Resistance against Japanese Aggression (1937-45). It contained more than 100 kg of chemical explosive or trinitrotoluene. "If it exploded, the blasting power could raze all the buildings within 600 square meters," Wu says. And that included residential buildings, a supermarket and a school. The conventional way to defuse unexploded bombs was to transport them to remote localities and detonate them. But nobody could predict whether the bomb would explode during transportation. Wu's unit transported the bomb to nearby open ground. More than 400 police personnel from the public security bureau were on guard everyday, to prevent anybody from approaching the bomb. That was when Wu thought of Ji and his invention. Ji had obtained a national patent in 2009 for his invention, and had modified it further. Before leaving for his mission, Ji researched online about the bomb. But all he got was bad news. For instance, a World War II bomb found at a construction site in Gottingen, Germany, on June 1, 2010. After the evacuation of 7,000 people, the bomb exploded unexpectedly and killed three experienced sappers, who had defused up to 700 bombs in more than 20 years. Six people were injured. Like Germany, China, one of the major battlegrounds of World War II, has many unexploded bombs, though the total number is unknown. Even though Ji was depressed with what he read online, he threw caution to the wind. Together with his partner Song Xingwei, they transported the water jet cutting machine to the site to disarm the bomb on June 11. There was a fire truck and an ambulance, on standby. "If the bomb exploded, the vehicles would be blown into the sky with me," Ji recalls with a laugh. No tragedy happened. Ji successfully sliced the bomb apart. The bomb defusing machine was not Ji's first and only invention. Since the 1990s, Ji has successfully invented gasoline saving and anti-theft equipment, which won him national patent certifications, amounting to 2 million yuan (US$317,000). Ji says he has a knack for engineering and machinery. About 20 years ago, Ji and Song worked together at an auto repair garage. "I could tell what's wrong with a car by listening to the sound of its engine," says Ji, who picked up his love for inventing during those early years. 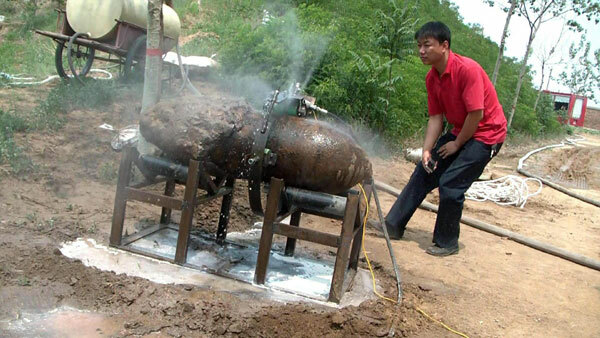 In 2002, Ji's friend, Zhao Chengning, from the army, suggested that Ji invent equipment to destroy waste ammunition. "The usual way to collect the ammunition and detonate it in the open air was unsafe and caused air pollution," Zhao says. Ji invented an automatic ammunition disposal furnace, the first of its kind in China. It is now used widely by the army and police to treat waste ammunition. But, the furnace was unable to dispose of the huge bomb, prompting Ji to research techniques for disposing of bombs. "Most ammunition technicians in Western countries use advanced tools like X-ray, high-performance sensors, remote control disposal vehicles and even robots, but those are too expensive," Ji says. Thus, he switched his focus to a water jet cutting machine, which is commonly used to slice metals and other materials in various industries. Water jet cutters are commonly connected to a high-pressure water pump where water is then ejected from the nozzle, cutting through the material by spraying it with a high-speed water jet, mixed with other abrasives, such as garnet. "The problem with commercial water jet cutters is the strong pressure, which could impact bombs. So, the key was to lower the pressure, and it was not easy," Ji says. "Industrial cutters have a water speed of over 320 km/h, but we need to control it to under 80 km/h," Ji adds. Ji picked up computer programming to create the remote control of the cutter. "He bought books and locked himself in a room, eating instant noodles for weeks," Song recalls. According to Ji, there is a huge market for such machines. In 2008, the Olympic Games imported an anti-bomb water jet cutting machine from a German company, which cost US$200,000. Since 2010, Ji has been selling his water jet cutter to public security bureaus, fire stations, as well as oil and gas companies all over China. In 2011, his cutter was bought for the World University Games in Shenzhen. After working for eight years, Ji Xingang's bomb-defusing device is now used by many public security bureaus, fire stations, as well as oil and gas companies in China.